Recently Coach Mike Rowe shared the video below with us outlining a nice teaching progression on how to teach Receivers how to block. This video does a nice job of demonstrating a number of drills and coaching points that can be applied to the youth game. As a new youth football coach, one of the the skills that I struggled with was teaching my Running Backs and Receivers how to block in space. It’s a skill that I believe is difficult for young athletes, but one with lots of repetition can be learned. 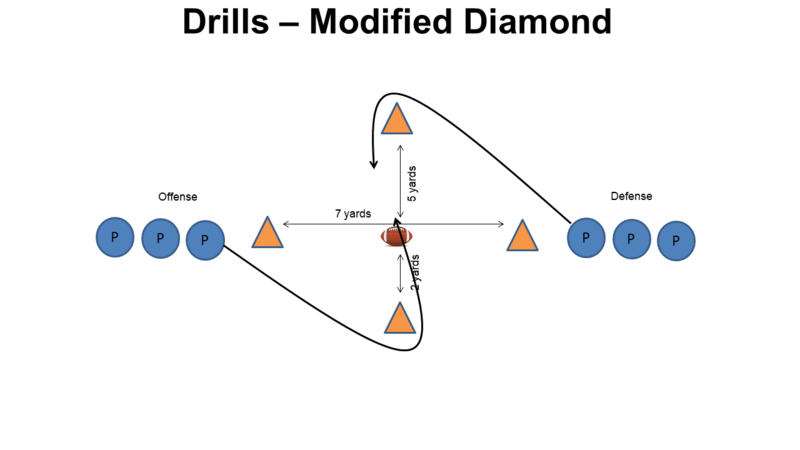 One of our go to drills over the past several years to teach this skill has been the Diamond Drill that we orginally learned from Coach Dave Cisar at Winning Youth Football that we have since modified a bit for our purposes. On the whistle, the Defender must run around the designated point of the diamond trying to get to the center of the diamond to try and touch the football. The Blocker (offense) runs around the designated opposite (shorter) side of the diamond attacking the defender and keeping them from touching the football for 5 seconds. Blocker needs to run his feet keeping a low center of gravity with his head up and helmet below the Defender’s chin. No Lunging! Defender can use any type of move they want after rounding the designated cone, but should not be allowed to dive at the football. Depending on the age group you are coaching you may have to play around a bit with the dimensions of the Diamond. If interested in other drills for your backs and receivers, we suggest you take a look at another article we published covering Youth Football Drills for Running Backs and Receivers. This not only contains another Stalk Blocking Drill, but has links to other valuable drill material as well.